The fascination of the brand LAMBRECHT is made up of many factors: the legendary product quality is no coincidence but arises from the uncompromising supervision of every single step from development to production. 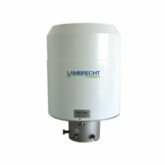 More than 150 years ago in 1859 the founder of the company Wilhelm Lambrecht began with the production of meteorological instruments. LAMBRECHT meteo is a young company that has been outsourced in 2015 from the traditional Wilh. Lambrecht GmbH. Behind this stands a team of dedicated and competent employees and experts that is active in the market of meteorological measuring technique since many years.